Do you have your another trade show coming up in the next few months? Or is this year your very first attempt at a trade show? Whether you’re an experienced brand manager going to your 25th marketing trade show or a newbie going for the first time to your company’s industry show, pre-planning is the key to having a successful show. Developing a game plan ahead of time can make a huge difference. Perhaps you have a huge booth to pull together. Maybe you’ll be using a QR tag. Or a digital video on your chest. Maybe you’ll just use a small retractable banner with literature. Now is the time to pull out your booth, set it up and decide what needs to be revised. Does your literature have an old phone number? Does your retractable banner refer to an outdated product? Can’t find one of the literature stands that you’re sure you packed away in the storage room? Don’t wait until a few weeks before the show! Use this handy Trade Show Marketing checklist right now as a starting point for reviewing your needs to help you have a successful trade show result. __ Free gift – something like custom koozies that are personalised to your business will be a great idea to promote your business after people have visited your booth. __ Comfortable shoes – most shows have a thin piece of carpet on top of concrete. You’ll be glad to have good shoes! __ Purell hand wash – to increase your chances of staying healthy when shaking a lot of hands! __ Band-Aids – dry air makes for paper cuts. Good luck with your show! Let me know how it went — Did you forget something that I should have listed on this tradeshow checklist?? Great information. As a company that designs and builds tradeshow exhibits for our local and multinational customers, I am always amazed at how too often exhibitors are last-minute. Commonly the person ultimately in-charge of the physical exhibit is not in charge of preparing the people attending the show for a successful presence. The exhibitor should work closely with the exhibit builder whom has many years of experience and can guide them on the do’s and don’ts as well as the many items and tasks that are easily overlooked. After all, you talk to your mechanic about general auto care and maintenance so why not talk to your exhibit company about general show preparation. At Archex, Display we always have discussions with our clients that extend well beyond the structural components to help them leave the show with positive results. 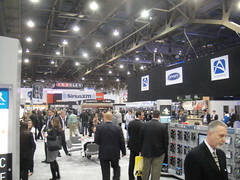 Tradeshows are a complicated beast and trying to go it alone is overwhelming to say the least. Again, great article. Concise and useful. Thanks for leaving a comment. The point about “start early” should really be stressed. It definitely makes a better end result. Companies aren’t forced into a decision because of the time constraint and save money by not having to pay a rush production charge or pay for more expensive faster shipping.